Early next month the second edition of Washington Wine & Wineries: The Essential Guide hits the shelves. Coming almost three years after the first edition, the book has been completely revised and updated. The need for a new edition, which includes greatly expanded winery listings, is indicative of the fast pace the Washington wine industry is growing. It also reflects the additional vintages numerous wineries now have under their belt. Author Paul Gregutt writes in the introduction, “Reading this book should feel like a tour through a state with an old friend who happens to be a local and who knows it well. I am that friend.” He more than succeeds. Washington Wines & Wineries is written in the crisp, engaging style that has made Gregutt such a compelling writer over the years. It is a book the novice can understand and enjoy but still contains enough detail to engage and inform people already familiar with the state and its wines. Gregutt, whom I consider a personal friend as well as a professional friend in arms, serves as contributing editor for Wine Enthusiast and as a columnist for the Seattle Times. He also writes a must-read wine blog. Gregutt moved to Washington in 1972 – the same year the first vines at Champoux, Celilo, and Sagemoor vineyards were planted. Much like there is no substitute for vine age, Gregutt brings to Washington Wines & Wineries a perspective that can only come from being on the ground in Washington for almost forty years. During this time the industry has grown from a handful of wineries to almost seven hundred. 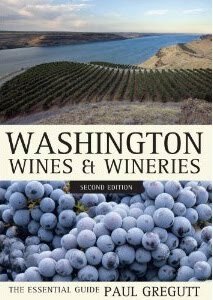 Like the first edition, the second edition of The Essential Guide provides information about Washington’s history, grapes, viticultural areas, essential vineyards, and most important wineries. While the first edition of the book was intended to make the case for Washington as a world-class wine region, Gregutt now takes this as a given. Though there is still work to be done bringing this message to the masses, the case is now clear. Washington Wines & Wineries begins with individual chapters on the state’s history, its viticultural areas, and grapes. Gregutt then follows with the state’s top twenty vineyards - an expansion from the ten vineyards listed in the first edition. Vineyards in this chapter are divided into ‘Grand Cru’ and ‘Premier Cru’ sites. The meat of the book, however, is the four chapters and almost two hundred pages devoted to the state’s wineries. While the first edition included about one quarter of the state’s wineries in its chapters, the new edition has been expanded to include one third. The number of entries has approximately doubled. Gregutt uses the same standards to evaluate wineries he used in the first edition. However, he replaces the controversial 100-point system he used previously with a star-based system. Chapters are devoted to five star wineries, four star wineries, three star wineries, and ‘rising stars.’ Each of these chapters begins with an explanation of the criteria used for including a winery. While the list of wineries in the book has nearly doubled, any such list is bound to stir discussion and dissent about which wineries are included, which are not, and where they are ranked. Gregutt acknowledges this, writing, “Like any list, it can be challenged, argued over, or picked apart.” Reading an opinionated list is, of course, part of the fun and part of the point. Gregutt is bringing his extensive experience to bear in writing about these wineries. The introduction of the book provides a summary of the methodology Gregutt uses to evaluate wines. It also contains the disclaimer that some wineries do not submit wines for reviews and thus cannot be evaluated. Overall, the second edition is much like a new book in many respects. Numerous aspects have been revised, added, or subtracted. Gone are most of the sidebars that were in the first edition, which, while interesting, distracted from the overall flow. Also gone are the chapters on the future of the industry, which are now condensed into the epilogue or removed entirely. The result is a considerably more fluid and compelling book. In addition to these numerous expansions and improvements, there are a couple of hiccups in the second edition leftover from the first. The chapter on the state’s grapes, which provides a fairly exhaustive listing, gets bogged down at times. Ordering the more important grapes and the lesser players might make for easier reading for those unfamiliar with Washington. Additionally, the ‘best varietally labeled bottles’ lists get long for certain grapes. Picking the top twenty or so, while no doubt controversial, might provide higher value to consumers. Still, these distractions are minor. Ultimately, Washington Wines & Wineries is indeed an essential guide. It more than amply accomplishes its intention of providing the reader with background on Washington State, its wines, and many of the best wineries. For anyone interested in the subject, it is, quite simply, the indispensable and authoritative book on the subject. Gregutt concludes the second edition by writing, “Those of us fortunate enough to live and work here invite the rest of you to come visit and see what all the excitement is about.” Hear hear. Note: Paul Gregutt will be signing copies of Washington Wines & Wineries: the Essential Guide at Full Pull Wines Thursday September 9th. Look for additional signing events on Facebook. Book received as promotional copy. Note: Those interested in the Sept 9 book-signing event (which will also include wines from Boudreaux Cellars and a concert with PaulG and Rob from Boudreaux) should e-mail me. Tix are $35 and will go on sale Monday (Aug 23) to the general public after we give Full Pull list members first crack at tix this weekend. Great review, Sean! I can't wait to get a copy of the book. Paul is a great resource for Washington wine. P.s. when are you going to write a book? Sean, thank you for the exceedingly kind words. Among the talented new crop of blogger/writers, you are the most comprehensive in your investigations of all Washington wineries, so your words are particularly valuable. One minor point – I did in fact choose the 8 most important grapes (four white and four red) and put them first in the lineup. But you are right, those lists get pretty long. It was my thought that it would enable me to include more wineries that did not rate a full entry but made at least one exceptional wine. Thanks for a truly thoughtful and timely review. Paul Z and Josh, thanks! Paul G, you are quite welcome and, of course, quite right on having the four most important reds and whites up front. I was thinking about it from the perspective of someone unfamiliar with the area trying to wrap their head around what we produce here and how much of it. This is, of course, difficult to do because we produce a lot of different grapes and some of them in minute quantities. It's not going to get any easier either with more and more things going into the ground. Perhaps a table listing the production numbers for each of the grapes? Of course, this might get stale very quickly. A tough one to tackle. Much like for the state's growers and wineries, it is both a vexing and interesting problem that Washington is able to produce so many different grapes. I see some of this review as a counterpoint to what I recently wrote on the same topic, but sincerely appreciate that we all have different opinions. Like you said, that's a large part of the fun. "The introduction of the book provides a summary of the methodology Gregutt uses to evaluate wines. It also contains the disclaimer that some wineries do not submit wines for reviews and thus cannot be evaluated." I apparently missed this disclaimer and will re-read the introduction to find it. Not that I'm at all doubting you, I just want to read the whole context. My quibble is with the word "cannot". They may very well be what Mr. Gregutt wrote, but it's simply not true. Wineries CAN be tasted and reviewed without submitting samples. The correct word(s) are "are not". Chris, As you were kind enough to send a pre-publication copy of your review to my editors, I sent you a note offering to chat (offline or on) about some of the criticisms you leveled, and also to correct a few things that were simply untrue. In fact, there are a very small number of wineries that are not reviewed because they specifically do not want to be reviewed, and there are inevitably some that I simply missed. But it is absolutely untrue that I only rely upon samples sent in for review, and if a winery does not reach out to me I ignore them. I seek out many wineries (both new and old) every year, on my trips throughout Washington, including quite a large percentage who have never contacted me, and I am happy to say that many of them are included in this new edition of the book. Had you answered my e-mail before publishing your review, I would have been pleased to make that point in person. Paul, thank you for the clarification. I didn't recall receiving any correspondence prior to my post, but on checking my "spam" e-mail folder see that indeed you did contact me. My apologies for not responding there earlier. I will do so, so we don't clog Sean's comments about something he didn't write.